← Grackles & Bread Dipping – An Ancient Ritual? Thank you to those of you that are hanging in with me although I’ve not posted in months. I appreciate you very much. The reason I’ve been absent is because my blog software (that I love) has been experiencing some difficulties and I’ve learned it is being phased out. As such, I am carefully seeking an alternative – one that will hopefully transfer everything I’ve written thus far. I have much to share and wish to do so once I’m back on track with a new program. I appreciate your patience as I go through this transition! In the meantime, so that not all is lost with this post, please feast your eyes on my latest Clematis vine. It is the variety “Darius” – an early bloomer with light lilac petals that have a deep purple stripe in the center of each. P.S. This is the new software . . . hope you like it as well as I do! 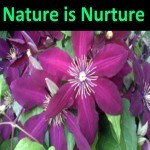 This entry was posted in Plants, Uncategorized and tagged Darius Clematis. Bookmark the permalink.